For some of us though, the sun shining and snow melting season of Spring in Edmonton isn’t all rainbows and butterflies that we’d expect. For some of us, more sun shining means more squinting and eye strain, leading to increased headaches. Not freezing our buns off every day and an increase in temperature means changes in barometric pressure also leading to increased headaches. For some of us, the snow melting and the green (brownish) grass now showing means snow mold and the allergy symptoms that go along with it. Not to mention all of the things that will start to bloom in the next month, causing more allergy symptoms such as sinus congestion and headaches. Acupuncture is a great way to help out the transition into the Edmonton spring for those of us suffering from headaches and allergies. Acupuncture helps regulate and boost the immune system, and it also has anti – inflammatory and antihistamine effects on the body, which is how it reduces allergy symptoms such as allergic rhinitis. 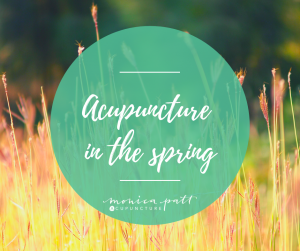 Acupuncture is also great for treating headaches and migraines at any time of the year, but also especially in the spring if you are part of the “some of us” who get an increase in frequency and severity at this time of year. Headaches and migraines are often caused by a combination of different causes such as barometric pressure, hormone fluctuations, neck and back tension, eye strain, jaw clenching, stress, diet, and the list goes on. Chinese medicine is effective in treating headaches because the diagnostic method it uses take into account all of the possible causes and treats the person for their unique cocktail of headache triggers. One of the reasons acupuncture is effective is by reducing pain. “Acupuncture has been demonstrated to enhance endogenous opiates, such as dynorphin, endorphin, encephalin, and release corticosteroids, relieving pain and enhancing the healing process.” (Patil et al, 2016). Patil, S., Sen, S., Bral, M., Reddy, S., Bradley, K. K., Cornett, E. M., . . . Kaye, A. D. (2016). The Role of Acupuncture with Pain Management.Curr Pain Headache Rep,4(22). doi:10.1007/s11916-016-0552-1.